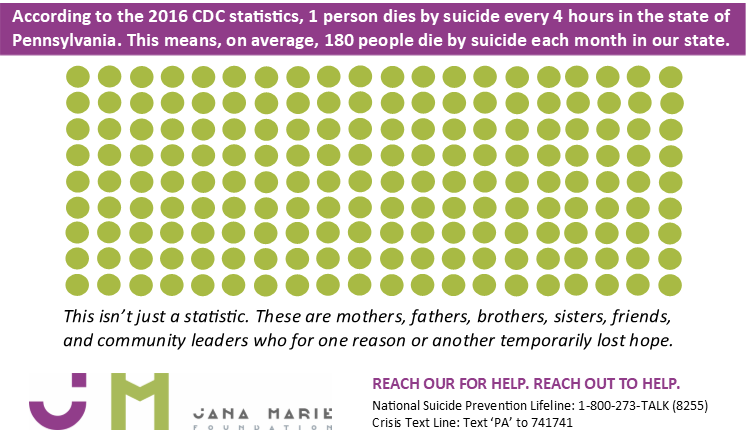 Annually, Jana Marie Foundation works with the Centre County Board of Commissioners, the House of Representatives, and the US Senate to proclaim September 10th as Suicide Prevention and Awareness Day and the month of September as Suicide Prevention Month. Join Jana Marie Foundation for our annual community dinner, program, and candle-lighting ceremony. This event is designed to create public awareness, educate the community, remember those we have lost, give hope to the survivors and end the stigma around mental health. In the state of Pennsylvania, one person dies by suicide every four hours, making it one of the leading causes of death. Suicide is preventable. Sadly, the prejudice and discrimination often associated with mental health and suicide works against suicide prevention by discouraging persons at risk from seeking lifesaving help, further traumatizing survivors of suicide. This designated month sheds light to the importance of suicide prevention and provides an opportunity for us to join forces with other community organizations and elected officials to help dispel myths and encourage help-seeking behaviors. Annually, Jana Marie Foundation works with the Centre County Board of Commissioners, the House of Representatives, and the US Senate to proclaim September 10th as Suicide Prevention and Awareness Day and the month of September as Suicide Prevention Month. We are so grateful for their continued support in our efforts!